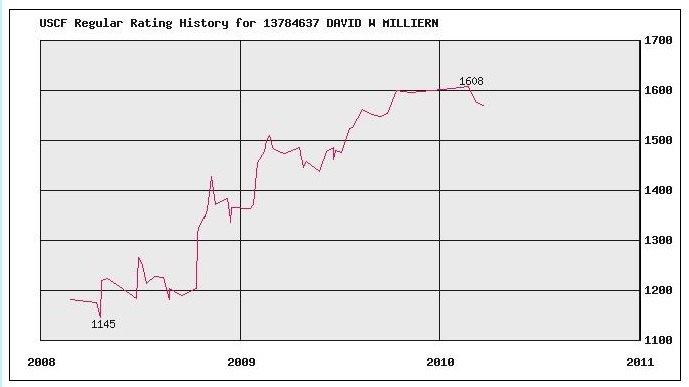 What is most compelling about this graph is that my peak rating moved up from a previous 1668, which I only every briefly touched before tanking, and, for the most part, I remained firmly in the 1500’s (sometimes lower) prior to doing de la Maza’s program. My previous best win was 1712, but, during my peak, which lasted the whole last week of the last circle, I smashed numerous players rated well above 1700, my best being a win against a player who was rated 1819. Given the peculiar nature of this kind during this particular stretch of studying 1,000 chess puzzles in cycles, I have to think it entirely reasonable that much of the increase was due to the program. 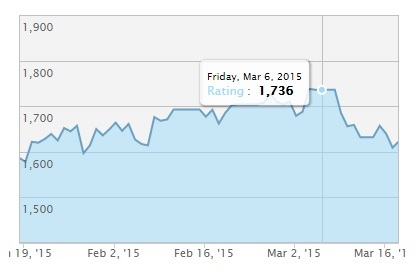 I especially think this is so, because, as the cycles progress and I did more problems, the rating increases. There were other variables in play. For instance, I read a book on endgames (by Pandolfini) and the early goings of a book on chess strategy (by Grooten), but I had less and less time to study these, as the number of tactics problems increased per day. Despite not studying those books, my rating continued to increase. There has been a negative side-effect: exhaustion. A couple of days after my program was over, I felt completely exhausted, and I am still feeling it more than a week later. On top of the feeling of mental exhaustion, which hasn’t been helped by other intellectual endeavors (e.g., philosophy conference), I have been experience extreme chess blindness, which is the case when you look at positions and have a difficult time recognizing very, very simple aspects of the position. For example, I have been incapable, in blitz games, of determining whether I am leaving a piece en prise by making a move. However, I have experienced this before. Who knows what the actual cognitive science is behind this phenomenon, but I appear to experience extreme chess blindness during periods in which my brain is…consolidating information (? ), learning (? ), integrating old knowledge with new knowledge (?). To be completely honest, I don’t know what it is that’s going on, but my extreme bouts of chess blindness have always been followed by extreme leaps in ability. Maybe Aristotle felt that natura non facit saltum, but the nature of my in-brain learning processes certainly do, as evinced by the following graph and it’s combination of precipitous climbs. (Note that, while I am using chess.com blitz ratings to assess the benefits gleaned by de la Maza’s program, the ratings represent very different information than this USCF rating graph. The online rating is blitz, i.e., 5 minutes per player, as opposed to the classic, 2+hrs per player rating by the USCF. Additionally, my classic rating tends to be 400 points higher than my online blitz rating, e.g., it was 600 when my USCF strength was 1,000, and 1050 when I was 1450 in the USCF.) Toward the end of my tournament career, I was a C-Class player with at least one A-Class performance, and this followed a major instance of chess blindness; so, while the chess.com graph indicates an immediate and precipitous drop in ability, I think this is entirely explainable by past experiences. If my blitz playing ability returns to 1700+ in the next couple of weeks, then the drop off will be understood as a relic of my learning process. Nonetheless, the fact that, even feeling so out of tune with the game and experiencing horrible chess blindness, consistently playing above 1600 means success. excellent. thanks for sharing this. I’m interested in the “bouts” of extreme chess blindness- bc I think I’m in a period of this as well. I have done about 3k chess tactics since mid August of last year, and I find myself struggling with inexplicable blunders. ie. making moves that are hang material; either en passe or with very simple tactics…. even in longer games! so I have hopes as you say , that this will be following by a “leap in my ability”. Hi, Jason. Have you demonstrated stronger play than you are currently exhibiting? For most people, I think plateaus occur where you are growing then level off despite a large amount of study. My drops in ability are unusual among chess players, I am finding. Most do not experience steps backward, or, at least, not 100+ point downturns. It stinks, and despite having them semi-regularly, I have not gotten used to them. They emotionally provocative and frustrating, but one has to keep on chugging. I really have no room to complain, given my rating jumps and their regularity. I have not understood the meaning of the blunders, only that your description of “extreme chess blindness”, fits. And I do think I am generally improving quite a lot these days. I’d also say that this seems to be passing and that the last few days have yielded some better games, without as many blatant oversights. one thing I have done, though, is entirely stopped blitz. I was never an addictive blitz guy; but for a little while I decided to give it a shot to lift my abysmally bad blitz. once you start losing , there is the gambers delimma- where you feel you have play twice as much to win back what you lost…. And Perhaps blitz might have been the very cause of the blunders; its hard to be sure? I really like blitz, but I have always stunk at it. Like I said, there tends to be a big difference between my classic USCF rating and my chess.com blitz rating. I think my chess blindness is residing. After dropping almost 150 points, I am down 50 points from my peak. We’ll see what happens with this next Seven Circles program. I have my doubts that it can improve my blitz rating so much more, because the people I am playing at that level are players FIDE rated 1800 and above. The Seven Circles is only really supposed to get you to Expert (or A-Class, since de la Maza may have been over-estimating his program’s ability). For this next run through the program, I will still pay attention to blitz data, but I will start tracking my performance on chess.com’s Tactics Trainer. I’m catching up and just realizing what a huge amount of work you have done 7×1000 and even more struck by what your attempting to do 7×4000. I’ve seen the polgar book you speak of ; its a brick! wow. Your above my elo grade (by a lot) and clearly am charting a path of you’re own… but I would second silentknights thought process a little and ask; are you so sure this kind of commitment is the best investment in your game? with that energy and drive, you could for example devour the anthologies. On the other hand, I have an admiration of what your doing. I think many people rightly say that the circles burnt out more people than it helped. but you seem to be defying the burnout. GJ. anyways, Realizing that the circles concept is that your perform your puzzles more rapidly as you iterate; makes me wonder? did you in fact reduce the solve time for most of your puzzles. 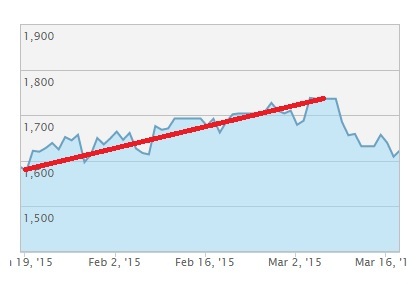 I have been tracking that , specifically, and I don’t show constant improvement…. did the times decrease more from 1st-2nd circle ? or did you spot decreases even when the circles were becoming intense…. I guess the point of this, when solving the puzzles becomes stressful does this tend to increase pattern recognition building? or was it very much the other way? I think I really don’t think the “commitment” is much of a commitment. It takes about an hour and change per day to do the first couple of circles. The last 6 days (cycles 5, 6, and 7) are the real commitments. I think I said in a prior post that one should probably arrange to have spring break or a vacation line up with this week of the program. As far as it being worthwhile for me, I think it still could have a decent amount of worth, but I can’t be completely sure. Many of the tactics trainers, but not chess.com’s for certain reasons, have me at about 2100-level strength in tactics. Really, I’d like to push my chess.com Tactics Trainer to 2000+. The long and the short is that it isn’t really that much of an investment (for a serious player), and I think the value to be had is immense, especially for me. Most of my draws and wins against USCF A-Class and Expert players came right at the end of my tournament career, and I did that through brute calculation. Being able to see tactics at a glance will improve my chances of winning and being fresh for late stages of long games. Simply being able to see and recognize quickly the tactical patterns I already know will be of immense value; but it is hard for me to imagine that I won’t pick up a few additional patterns in my memory stockhouse. There was one fellow, possibly the empirical rabbit blog (but I can’t recall), who said that the key to not burning out is not having strict expectations on how many problems are to be done each day, but keeping it as regular and even as possible is the way to go. Some days, I would only get through a small percentage of what I had scheduled, but there were days where I would just keep the feet moving, so to speak. Yes, the solve-time was cut almost in half between the first and second circle for me. The thing is that you need to take your time on the first circle (or the second circle, with the way I did things). After you mentally work through the calculation, you need to try to look at the position and see, gestalt style, the elements that indicate the tactical motif is there. This has helped, in general. Even if I can’t see the tactic in a blitz game, I take a moment and calculate and find the tactic, because my spidey senses have been set off. The best advice I can offer on times when you don’t feel motivated is this: I wonder for a long time whether I actually learn anything when I am tired, sleepy, feeling unmotivated, or absolutely stinking at chess (especially blitz, which I stink at anyways). What I have found is that I do learn effectively when I continue to study in these states. The progress is not seen immediately, but the progress I make is inexplicable otherwise. Most of my mental energies are spent on professional academic activities (doing philosophy, reading physics papers, working out math problems, etc. ), so I absolutely have no choice but to spend time on chess when I am in these states. However, current neuroscience suggests there is value in studying in these states, particularly sleepy states. Since the brain works backward through the experiences of the day, most learning circles around the very last mental (or physical) activities that were performed. This is why you may have heard that studying 30 minutes before bed can help you memorize or learn something. The content that is least likely to be learned is the information worked on upon waking. Love the tile and the opening. Then you lost me, guy. But, if you make it to the top 1,000 chessmasters of the world I will learn the basics of chess in your honor.